If you search for the most modular laptops available today, you will surely see the name of Microsoft Surface Book series everywhere. The initial version of Surface Book was launched back in 2015. As it is a 2-in-1 PC, you can use it both as a laptop and as a tablet. Its upgrades like Surface Go and Surface Book 2 are also coming with some more advanced features to provide you more power on your hands. Though it has all the necessary tools to make it the best portable computer, you need an external display for Surface Book to set up a perfect workspace at office or home. Today, we will see the top Surface Book Dual Monitors available in the market. 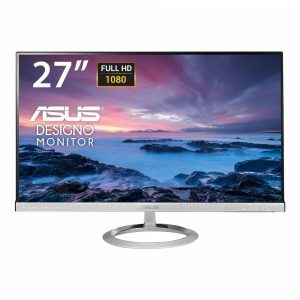 As you can see in the title, the Asus MX279H is a 27” display which comes with a LED-backlit support and frameless screen. The ergonomic design of the monitor will allow you to tilt it according to your comfort. I am currently using this display as an external monitor with my Surface Book. The Full HD (FHD) IPS display offers a resolution of 1920 x 1080 pixels (1080P) with a 178° wide viewing angle. This monitor is available in other sizes including 23”, 25”, 29”, 31.5”, and 34” to choose your suitable display. It has a built-in Video Intelligence Technology which optimizes the picture quality and delivers a stunning visual experience. It has HDMI and VGA ports provide the connectivity options for various devices. This screen is available in different styles too including 4K, WQHD, UHD, Curved, etc. It contains inbuilt speakers with 3W power and the support from Bang & Olufsen ICEpower. You will get a three-year warranty from the company. 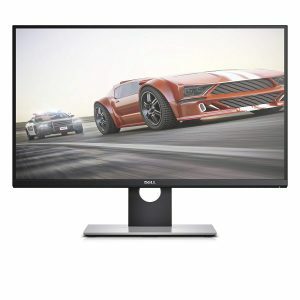 The Dell S2716DGTR is one of the most popular 27” monitors for gaming and dual display needs. It has the NVIDIA G-Sync technology which eliminates the screen stuttering and flickering. Moreover, it offers the best in class value for the 1440P gaming needs on the external monitor. It will deliver jitter-free, vibrant visuals with reliability and premium support. It offers an optimal resolution of 2560 x 1440 pixels (1440P) on a 27” viewable area. The screen has a rapid response time of 1ms and a refresh rate of 144Hz. As the connectivity options, it has one HDMI, one DisplayPort, one Audio, one headphone, and four USB 3.0 ports. The widescreen flat TN panel has an anti-glare coating with 3H hardness. The ergonomic stand has adjustment settings for swivel, tilt, pivot, and height. It has a viewing angle of 170° horizontal and 160° vertical. You can also select the 24” screen size and if you want to mount it on the wall to save the desk space, then get the single arm or dual arm mount attachment with the monitor. In the box, you will also get a power cable, a USB 3.0 cable, one DisplayPort cable, quick installation guide, drivers and documentation media, an ergonomic stand, and safety information. The AOC I2267FW IPS frameless display offers a worthy functionality at a decent rate. It delivers solid color reproduction, wide viewing angles, a plethora of connecting ports (compared to in-class displays), and an attractive price tag. If you have a limited budget for setting up a dual monitor on the Surface Book, then I recommend you to go for this display from AOC. Its 29” widescreen will provide the resolution of 2560 x 1080 pixels (1080P). The IPS panel delivers great viewing angle and color reproduction on the screen. The frameless design makes it perfectly compatible for the dual monitor or triple monitor setup. It supports 16.7 million colors and 178° viewing angles. It has connectivity ports each for VGA, DVI-D, DisplayPort, and HDMI. 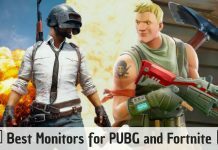 The monitor has a true gaming refresh rate of 60Hz and 5ms (GTG) response time. 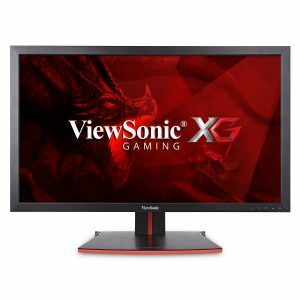 I recommend this display for the gamers, graphics designers, and multi-taskers who are looking for the budget option for their multi-monitor setup. 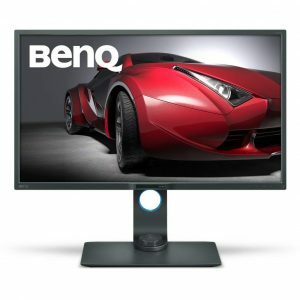 Though it is aimed for the professionals who want to increase their productivity rates drastically, the BenQ PD3200U will not disappoint the gamers at all. This designer monitor from a new line series from the company has a stylish build with high-quality characteristics. Its intuitive features are capable to handle both the business and pleasure. The 4K screen will deliver stunning picture quality with 3860 x 2160 pixel resolution on a 32” widescreen display. Its unique dual-view function allows you to use sRGB and darkroom modes when you need two screens. The KVM switch system will display contents from two different devices with a single keyboard and mouse input. It has won the 2017 Editor’s Choice Award from Tom’s Hardware which defines its usability and capability for all types of users. It is compatible with both the Windows and MAC Operating Systems. The IPS panel generates 100% color reproduction with a 4ms response time and 60Hz refresh rate. The flicker-free technology and blue-light filter will help to reduce the eye strain of the user. It is available in three different styles and four sizes to allow you to choose your suitable option for dual monitor setup. 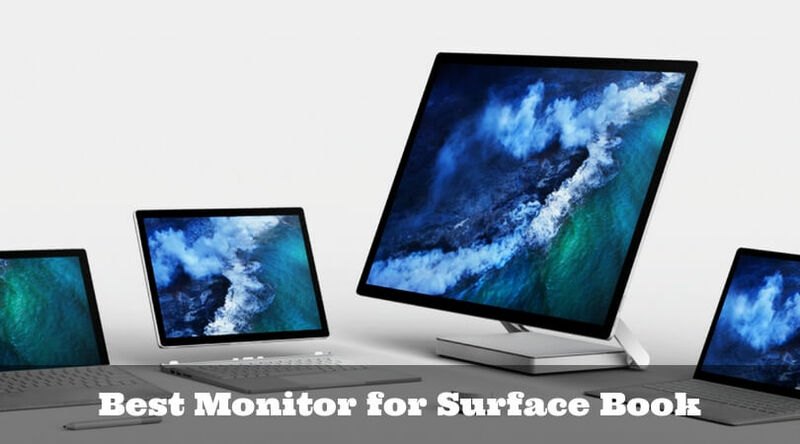 If you want to do multitasking like editing documents, surfing the Internet, watching how-to videos on YouTube, and play first-person action games on your Surface Book, then you need an external monitor to fulfill these needs at best. 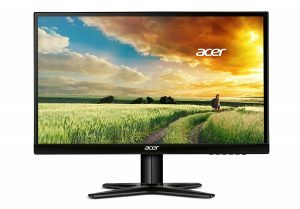 And the Acer G257HL claims to be one of the best dual monitors available in the market. Its stylish design with all-around performance helped it to be listed here as an option of an additional screen with a Surface Book 2-in-1 laptop. 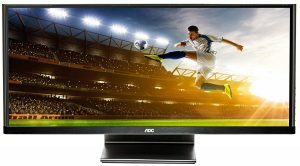 This G6 monitor from Acer has an excellent 25” screen which offers a maximum FHD resolution of 1920 x 1080 pixels (1080P). 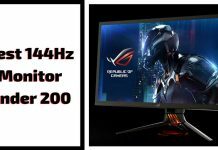 It has a rapid response time of 4ms (GTG) and a refresh rate of 60Hz which is quite enough to enjoy the games at best. Its IPS panel supports 250 cd/m2 brightness with 16.7 million colors and an aspect ratio of 16:9. This screen has DVI, VGA, and HDMI ports for the connectivity to Microsoft Surface Book and other PC systems. It creates stunning graphics with the top-quality moving visuals on the screen. It is RoHS compliant and meets the Energy Star Requirements which means it helps to save the power for almost 68%. The X-shaped stand will fit in any kind of desk space to allow you using it flexible. 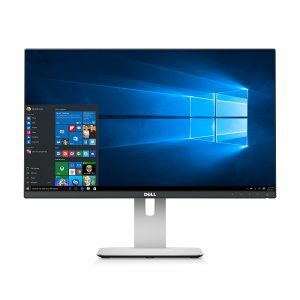 If you look at the most popular IPS displays in 24-inch screen range, then you will definitely see Dell U2414H in the top 3 lists. Its distinct functionalities fulfill different requirements of working and gaming. Along with the elegant design, it has the best-in-class image quality which makes it versatile compared to its competitors. The 24” screen of this display will provide you the FHD (Full HD) optimal resolution of 1920 x 1080 pixels (1080P). The IPS panel has an anti-glare surface with the hard coating of 3H & offers wide viewing angles. It creates a great color reproduction of 96% for 16.77 million colors to deliver an impressive viewing experience. It has a 6ms response time with a 60Hz refresh rate. The monitor is VESA compatible which means you can mount it on the wall to save the desk space. As the connectivity options, you will get two HDMI, one DisplayPort, one mini DisplayPort, one audio jack, and five USB 3.0 ports. The screen has options for rotate, tilt, pivot, and height adjustment to provide you comfortable viewing. This display is TCO certified and Energy Star compliant. With the gorgeous picture quality, highly responsive screen, multiple connectivity options, and 4K viewing capability make the ViewSonic XG2700-4K one of the best monitors for Surface Book. You will surely love the jaw-dropping beauty of the visuals presented by the screen and that too at an affordable price. If you are using the AMD graphics card, then go nowhere than buying XG2700-4K for the Surface Book dual monitor setup. The 27” screen will generate 4K UHD resolution of 3840 x 2160 pixels. Even though the panel is TN (Twisted Nematic), it generates great color reproduction to provide stunning visuals on the display. The AMD FreeSync Technology will allow you to have smooth frame rates for enjoying the content at best. With the black stabilizer, you can see the detail of every corner even in the darkest scenes of the game. It has connectivity options with DisplayPort, HDMI (x3), mini DisplayPort, and USB ports. It has 5ms response time and 60Hz refresh rate. You will have options for swivel, tilt, pivot, and height adjustments. The screen is also available in other six different sizes and styles. The package includes one LCD screen, one USB cable, one power cord, and one mini DP to DP cable. You will get an industry-leading warranty of three years from the company. Initially, I was using my Surface Book 2 only for my freelancing work and gameplay. But, it was not entertaining me much. After a few time, I made an external monitor setup on it. And with my surprise, I noticed a differentiable increase in my productivity rate. I can watch videos on the attached additional display and can work on my Surface Book machine side by side. Yes, I can use the split screen option, but it was not helping much. And you will call me crazy, but currently, I am using a triple monitor setup with my Surface Book! One of the most beneficial and welcoming things about the Surface Book is that, even with the timely upgrades in the machine’s hardware & software, the keyboard gives the same feeling as with its first model. It has a few changes in the keys and replaced some functions, though. Otherwise, the 2-in-1 computing machine gives an excellent experience of working and gaming. With the multiple monitor setup on the Surface Book, you can easily expand its capabilities. You can even make the dual monitor or triple monitor setup on it. And this setup process is relatively easy as the Surface Book comes with an inbuilt DisplayPort to connect the external monitor. You can use the third party USB docks, or external adapters to connect more than one displays. Let me know which display will you use a Surface Book external monitor from the list above. If you have any other potential screen in mind, then you also can share it here. 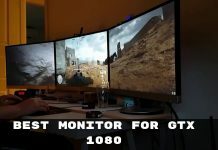 Previous articleBest Monitor for GTX 1080 – Which Monitor is Best for You?